The Conero Riviera is a place of incredible charm. Along its coasts the wild greenery of the Mount merges with the blue of the sea. Along its hills you can taste the dishes of our tradition accompanied by a glass of wine. The only problem you will have is probably that you will not want to leave this place. There are several things to see and they vary according to your personal taste. To help you deciding, we thought what are those things that if you come for few days in the Conero Riviera, you can’t really miss. If you have little time or you are simply too lazy to read till end, at the bottom of this page you will find a video that gives you an idea of what you can enjoy here. 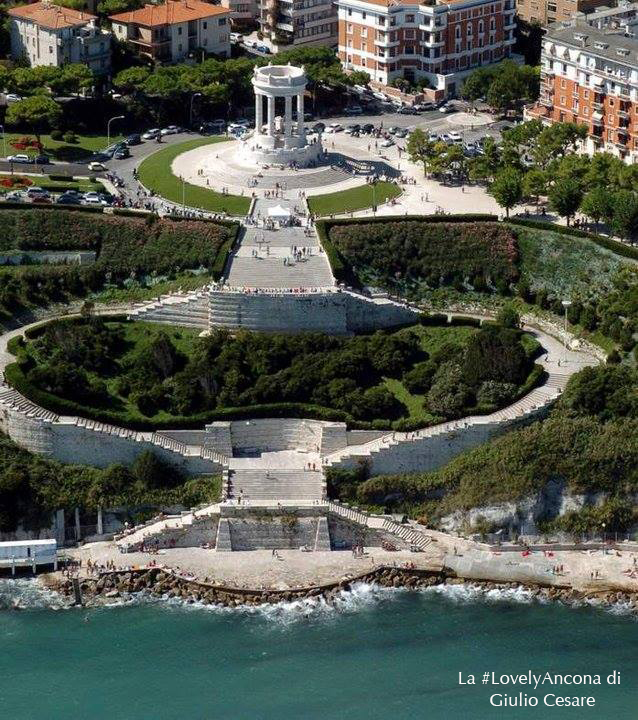 If you want to find out what are the top 5 places to visit in the Conero Riviera … let’s start! We tried to think about your tastes and to imagine what we would like to know if we found ourselves on vacation at your home, looking for some advice. We hope these tips will be helpful but … enough with chatter! Here following the “5 tips from locals”. Due Sorelle Beach is one of the symbols of Sirolo and of the Conero Riviera and we assure you that if it is in the first place on our list it’s beacause it truly deserves this place on the top. Do you ever wander with the thoughts, do you ever imagine, maybe when you are in the office and it is raining outside, of being alone and surrounded by nature? Do you ever dream to lie down on a beautiful wild beach with only the smell of the sea and the sun’s heat to warm your skin? Here we are, are you beginning to understand what is for many of us the Due Sorelle Beach. The advices to give you on this place are too many and only one article on the Conero Riviera is not probably enough. This is why we decided to write an entire article on Due Sorelle Beach, don’t miss it: the Beach of Due Sorelle. If you are looking for a good restaurant in Sirolo these are the ones where we usually go: the best restaurants in Sirolo. Further to the sea and the beach, why you don’t take a nice walk through the green nature too? If you like walking or just relaxing away from everyone and everything you may have found the perfect place for you. 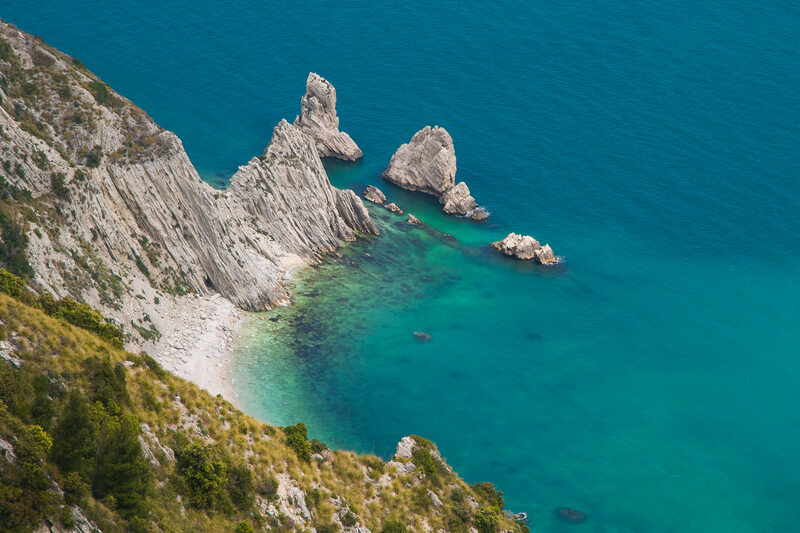 Not everyone realizes it, but if the Conero Riviera’s area is so beautiful, it is thanks to the Monte Conero that steeply plunges into the blue sea of these shores, creating contrasts and breathtaking views. There are no less than 18 paths, so you can choose the one you prefer, also considering your training level, but there are two paths in particular that you just can’t miss: Passo del Lupo and Pian Grande. 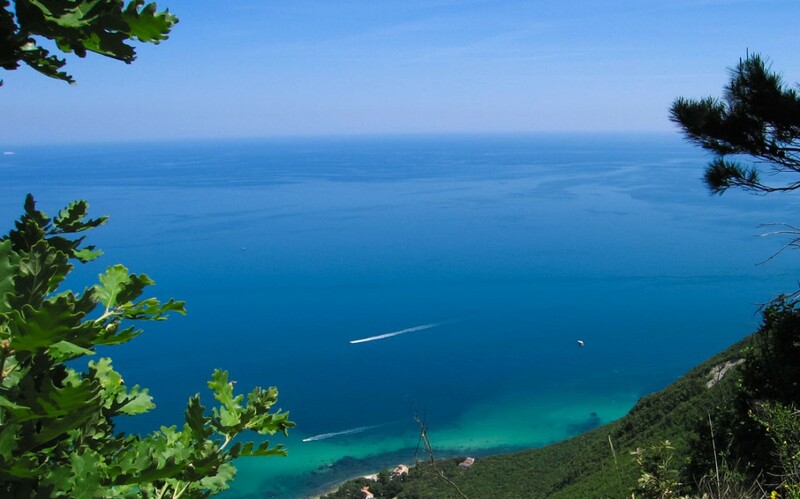 Arriving at the end of Passo del Lupo you will find yourself just above Due Sorelle Beach, while walking till Pian Grande you will be above the beaches of Portonovo. We don’t keep on describing as it would be simplistic to describe this beauty, but give us straight and go to see it, it will make you gasp, we bet for it! How to reach Passo del Lupo? Along the road that goes from Sirolo to Ancona, you have to turn at the fork for Monte Conero and start going on. After some curves, you will find to your right a black and green sign with the word “Bar Panini Belvedere”, placed at the beginning of a dirt path. You can park right after and continue by walk. Along the way you will meet three forks: at the first (there is a sign indicating the end of the road) you have to turn left. At the second keep right and then turn left uphill (there is also a signal of the Conero Park, which indicates the beginning of the path). The route is not very long, in about half an hour you will reach Passo del Lupo. We spoke about the Two Sisters (Due Sorelle Beach) and Conero Riviera and talking about it how could we miss Portonovo? 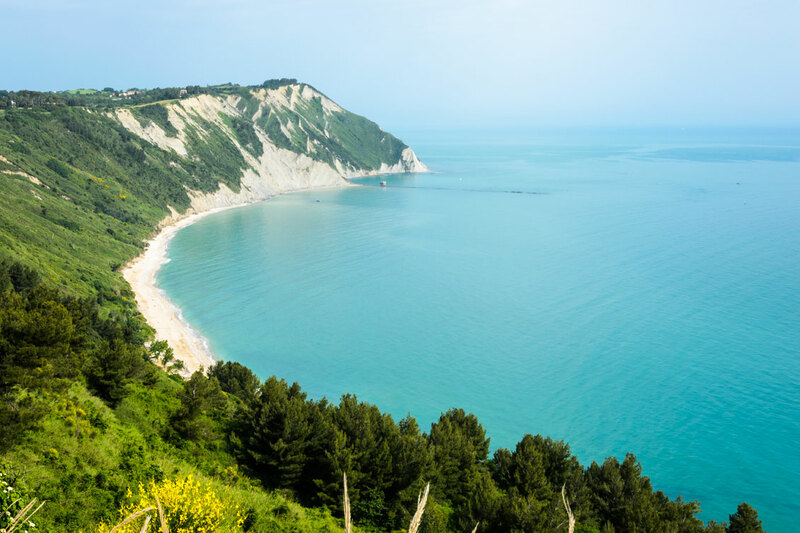 In Portonovo Bay lie the beaches par excellence of Ancona. The smell, the atmosphere, the spectacle of this place has something special in our opinion. A line of white pebbles divides the green of Conero from the blue of the sea, creating a harmony of unique colours. In the evening we suggest you to come here to eat at one of the little tables by the sea and taste the famous mussels of Portonovo (moscioli), accompanied by a glass of wine, the sound of the sea and the light of the stars. A tip: Portonovo is a true paradise, but during the high season tends to fill up very easily. Especially on weekends it is not easy to find parking for the car. However, there are shuttles that leave from the parking-lot which is located up the hill, before starting to decline curves that lead to this bay. If you want to have breakfast by the sea, an aperitif or a dinner, here there are some advice on where to eat in Portonovo: Bonetti Beach and La Capannina. For more information please visit the website of the consortium of Portonovo Bay. An alternative to the beaches of Portonovo is Mezzavalle beach. Mezzavalle is a unique beach. Long and wild, is the only place where you will not find neither beds nor umbrellas, Mezzavalle, in fact, it is a public beach. But like any special thing this comes with a price. The “price” of Mezzavalle (which for some has now become an enjoyable way to keep fit during the summer) has its famous and feared dirt road: a dirt road of about ten minutes path (to rise). Speaking honestly, there are people who, although from Ancona, have never come here for this reason, there are those instead, who comes every day and even with small children. So its up to you decide whether to come or not. If you have decided to visit Mezavalle the advice we give you is to bring something to make you shade during the day. Arriving here, in fact, you will see many “wooden constructions” (some sticks with a towel above) for this reason. Throughout the morning and a good part of the day there is not a corner of shade across the beach and here the sun burns a lot. Ancona is few minutes driving from Sirolo and Numana. Things to do and see in Ancona are a lots and perhaps for this reason this website was born. A beach: the beach of Ancona is that of Passetto. Real and characteristic in this stretch of rocky coast there are the famous caves of the Passetto, defined by some as one of the greatest examples of marine caverns. Over a century ago, in fact, fishermen began to dig into the rock of the mountain going to create real caves. Today some of them are simply a place to leave the boat, other locals, instead, have arranged them as real houses and they enjoy them from the first to the last sun during the summer. We also advise you to stop a few minutes at the top of the stairs leading down to the beach and admire the War Memorial of the First World War. A museum: the most famous museum located in Ancona is the National Archaeological Museum of the Marche. But if you like things a little bit more particular and you want to “try” something new, our advice is to visit the Omero Tactile Museum. This museum is the only one for blind people in Europe. At the entrance they will give you a bandage and you will have the opportunity to “touch the art with hands.” You will get used to not look and to use all the other senses. Blindfolded, only touching the various statues (not peek huh!) you will have to understand which statue you are touching. We suggest it especially with children as it can be a fun way to discover art. A monument: the monument that you can’t really miss is the Cathedral of San Ciriaco, the symbol par excellence of Ancona. Founded by Greeks, its origins are dated back to the third century BC and its name was given by San Ciriaco, the patron saint, whose body still rests in the crypt inside the church. In addition to the beauty of the church inside, we suggest to come here even to enjoy the view that there is from up here. You will end up, in fact, right over the houses of the city and the harbour, the perfect place for a romantic sunset! If after all these tours you are thirsty and you fancy a drink or a fresh beer, here you can find ideas for some places to try: Ancona Aperitif. But if you are hungry and you want to delight in a dinner, these are some places that we recommend you, both in the centre and a little outside of the city: Ancona Restaurants. Maybe you decided to spend your holidays in the Conero Riviera but it is raining? Or would you rather take a break from the sun and the sea? 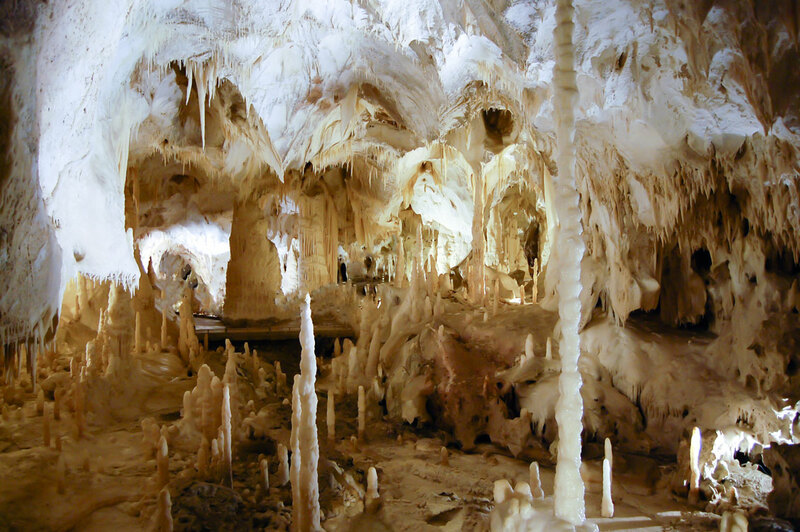 Barely an hour’s drive from the Riviera you can reach Genga to visit the Frasassi Caves: an experience that you should really live. We recently went again to visit them and each time it is impossible not to be amazed. You will see the result of patient work of water and rocks in the course of 190 million years, finding yourself in front of huge stalactites and stalagmites. These caves are so large that they could hold the entire Cathedral of Milan! The set of routs in the caves reach a length of 13 km. The natural sculptures inside reach more than 200 meters in height … pretty great, huh?! Are you ready to visit the Conero Riviera? 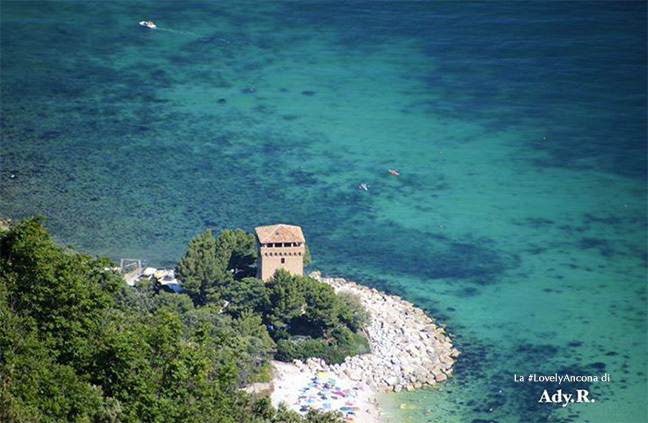 Have you got an idea about what you can see in the Conero Riviera? These are our 5 tips to spend a very special holiday. Obviously, things to visit are still many and looking within this website you will also discover all the other places worth to see. In the meanwhile, we leave you with the video made by the official Conero Riviera Association.